This entry was posted in Documentaries and Film and tagged Brian Willson on November 26, 2016 by Cammy. This entry was posted in Documentaries and Film, Military Culture (of Death) on November 23, 2016 by Cammy. Wow. I’m speechless after watching this trailer! I can’t believe a film about Gospel nonviolence will actually be on the big screen! This is what the world needs right now. The extraordinary true story of conscientious objector Desmond Doss who, in Okinawa during the bloodiest battle of WWII, saved 75 men without firing a gun. Believing that the War was just but killing was nevertheless wrong, he was the only American soldier in WWII to fight on the front lines without a weapon. As an army medic Doss single-handedly evacuated the wounded near enemy lines, braved fire while tending to soldiers and was wounded by a grenade and hit by snipers. He was the first conscientious objector to ever win the Congressional Medal of Honor. 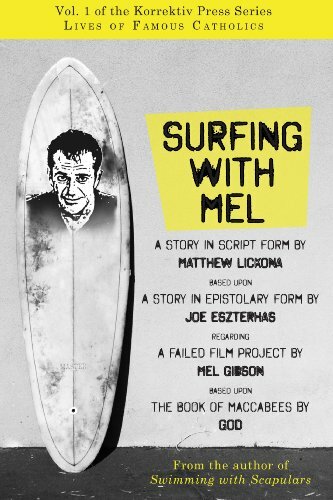 Oh, and as long as I’m on the topic of Mel Gibson, I simply must recommend a short story (well, it’s written like a screenplay but meant to be read as a story) called Surfing With Mel, written by the insanely talented Matthew Lickona. Do you have complicated feelings about Mel Gibson? Read this. It has so much heart and so much compassion at once, without fawning, promoting, or excusing. On April 11, 2012, TheWrap.com published a private letter from screenwriter Joe Eszterhas to director Mel Gibson. The letter chronicled, in alarming detail, their disastrous attempt to collaborate on a film version of the Biblical Book of Maccabees. The media flare-up that followed focused on Eszterhas’ characterization of Gibson as an angry, Jew-hating sociopath, but largely ignored the spiritual crisis at the story’s heart. Using the letter as a map, Surfing with Mel sets out to find some meaning within the madness, and winds up outlining a darkly satirical and deeply profane portrait of two men at war with each other, with their pasts, and with God. About the Korrektiv Press series Lives of Famous Catholics: Writing in his journal about the celebrities of his day, the author John Cheever observed that “we have a hierarchy of demigods and heroes; they are a vital part of our lives and they should be a vital part of our literature.” We agree, which is why the Lives of Famous Catholics series seeks to explore the life of faith by the light of the famous. This entry was posted in Conscientious Objection, Documentaries and Film, Militarism and Christianity, Nonviolence, Saints and Soldiers and tagged Catholic, film, Matthew Lickona, Mel Gibson, war on August 9, 2016 by Cammy.